Scaffolding is a technique to ease players into gameplay through paced and staggered revelation of gameplay mechanics. Scaffolding is used frequently in digital games to introduce one feature at a time. The most basic form of scaffolding in digital games is the tutorial; mechanics are shown to the player one-by-one and explained, and then real gameplay begins. Scaffolding in non-digital games has the exact same goals; just as a frog dropped in boiling water will jump out, but a frog placed in cold water slowly warmed will stay put, a player bombarded with mechanics and complex instructions may reconsider wanting to learn a new game. When done correctly, scaffolding will slowly and safely introduce the player to rules and streamline the learning process. Here are three rather eclectic tips on how to structure the learning experience of your game, and how scaffolding non-digital games differs from scaffolding in digital games. There are two ways to achieve this simulation in a traditional rulebook. The first is to have very specific rules for each turn in the game, and perhaps even to have the players stack the decks so they encounter game elements in an orderly fashion that can be introduced slowly. This is ideal because it really does emulate the best way to teach games in person. For every Tiltfactor game I’ve learned to demo, I have a specific order that I introduce the elements to allow players to jump into the game super easily. Unfortunately, this is fairly hard to do in a paper rules document. In fact, I’m not sure I’ve ever seen it done—let me know if you have. The second option is to give players “first play” rules that exclude some elements for easier learning, and then add them in later. This is very much like the above method, but instead of adding elements slowly after a few turns, it adds them slowly over a few games. Normally this method bothers me because I feel like I just spent an hour learning a different game from the one I wanted to learn. In a couple of cases, however, I’ve seen it done well. In Space Alert, because the game is coop and because the removal of elements for early gameplay doesn’t change the overall strategies and experience too much, this method works particularly well. The first few games introduce the spaceship you’re trying to protect, its basic functions, and simple enemies. Future games add new tech (like robots and missiles), and more complex enemies. The first reason this method works in Space Alert is because in addition to making the game easier to learn, it also acts as a difficulty ramp: as players get better at the game, it gets harder. The second reason Space Alert does this well is because it has VERY well-written rules for each successive game in the learning process. Risk: Legacy also does a great job of easing players into the rules, but this method works for Risk: Legacy for a very different reason. In Risk: Legacy the evolving game rules are actually designed to be part of the player experience and are advertised to the player as a feature of the game. This way players don’t baulk and the changing game rules, because the game as a whole is actually viewed as composed of 10 or so sittings, and not just one. It's important to note that while exception based games like Magic may seem on the surface to employ this kind of scaffolding, they actually do not. At first glance a designer might think that teaching the core system of a game to a player and then having all of the complex rules be exception based, conveyed through cards as they come up, works very much like introducing mechanics one-by-one. Unfortunately, in practice I've seen that while some types of gamers can deal with this type of teaching, most players, when told "Okay! Those are the rules, now just do what the cards say," immediately want to know all the cards that they're going to encounter, which isn't really a scaffolding process at all. In addition to mechanic introduction scaffolding like in Space Alert and many digital games, non-digital games also have another aspect of scaffolding that can be leveraged to improve player experience: choice scaffolding. Choice scaffolding helps ease new players from making simple initial choices into complex choices later in the game, because they might baulk if they were asked to make complex choices from turn one. The first way designers should help scaffold choice is by making early choices matter less than later ones. This allows new players to make mistakes early in their first game(s) without falling irreparably behind because their latter (and more informed choices) matter more. The drafting game 7 Wonders does a great job in this respect. The game is played over three "Ages." Each age has many more powerful cards in it than the previous one. Thus, while first and second age choices are important, it's really the third age that seals the deal. Settlers of Catan is a example of what not to do for early player choices. In Settlers, the first choice a player must make is really the defining one of the game: where her initial cities and settlements go. These placements determine what resources she gets for the remainder of the game, and a bad placement can mean little shot at winning. This means a new player's very first choice, before she has had any true exposure to gameplay, is the most important one, and this is both overwhelming and can feel terrible if she makes a bad choice. Perhaps the most important choice scaffolding is simply giving players fewer options, so that new players have very focused choices earlier in the game. The simplest way to implement this approach to choice scaffolding is through card costs in engine building games, and (as with most design), Dominion offers a great example. During the first two turns of the game, players usually have 3 or 4 copper to spend on acquiring new cards. While exactly what can be purchased with 3 copper changes, in the recommended set for new players, a new player would be choosing between 7 cards instead of the 16 cards they will be able to choose between when they have 8 copper to buy with. 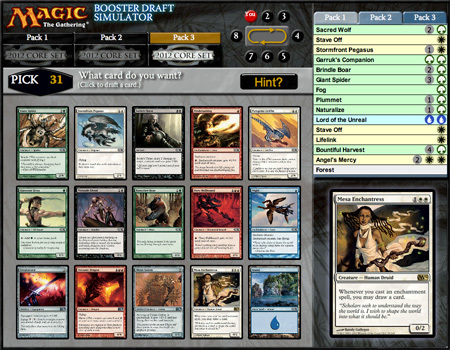 This approach is seen in many other engine-building games as well; for example, when playing Magic: the Gathering players have a hand of cards with various costs, and every turn they generally have 1 more resource than the previous turn. This means a player with a card that costs 2, one that costs 3, and one that costs 4 in her hand has very simple (or no) choices to make. She simply plays the 2 cost card on turn 2, the 3 cost on turn 3, and the 4 cost on turn 4! 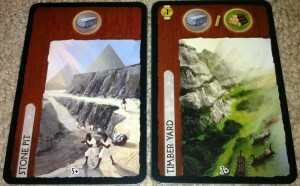 Despite 7 Wonders' exemplary design for the previous approach, it is another example of what not to do in this case. Since it's a traditional drafting game, players get 7 cards in their hand to start, choose one to keep, and pass the hand to their left. They then receive a hand of 6 cards to choose from, from the player to their right. This is the opposite of the ideal; the first choices are overwhelming, but the latter choices are extremely limited. 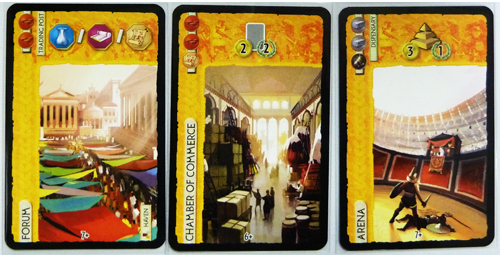 Of course, this still works fairly well in 7 Wonders, because even the 7-card choice is not too overwhelming. In the end, while scaffolding players into your game is valuable, it really only is important for getting new players over that first and second game hump. After that point scaffolding is no longer noticed by players. As we've noted before, however, that first and second game hump can actually be what stands between a player loving your game and it sitting on her shelf gathering dust. Does your game require reworking to scaffold new players' early choices? Only you can decide (with the help of lots of playtesting). Two little errors I think, first, four tips? Second, I believe the 7 Wonders card Forum pops up in Age II, of course there may be another copy in the third age, or I might be remembering incorrectly, but that seems a bit late to be putting down resource cards! Thank you for the interesting article! Great points about learning curve and introducing mechanics to ease in beginners. However, your Catan example glosses over the fact of it being among the most popular board games of the last two decades. According to Wikipedia, "As of 2009, over 15 million games in the Catan series had been sold..." So while these guidelines are useful, I'd suggest they may have limitations. Do you think Catan would have been MORE successful if it had scaffolding mechanics? I do not; it would have been a significantly different game, and probably taken longer to play. If a game is short enough, as in Catan, the lessons learned from that "initial mistake" are easily overcome in the next round. While I did gloss over the popularity of Settlers, I am by no means unaware of it. Sales figures are a dangerous way to measure design for two reasons. First, there's a question of target audience and game genre (we wouldn't say that Apples to Apples is better designed than Catan, even though I'm fairly certain the former has sold more than the latter simply because it is aimed at a different and wider audience). Second, there's the problem of age. Again, Monopoly isn't the paragon of board game design despite its ludicrous sales figures (at least ten times as many sold as Catan) - it's just been around for way longer. In the end, popularity and good sales just say that a game was better than other games for the same audience when it was released, and little more. That said, I'm a big fan of Settlers (well, when you add the Cities and Knights expansion), and I don't think it necessarily needs its initial placement mechanics changed. As I mentioned scaffolding usually isn't a dealbreaker for games that are fairly simple. Could Catan scaffold players' choices more? Yes. If there was some magical way to keep the mechanics the way they are while making newer players less beholden to their initial choices would it make the game better? Totally. But as you note, most changes have tradeoffs and in the case of Catan changing the gameplay may not be worth the benefit from scaffolding. Of course, that doesn't make Catan any less of an example of bad scaffolding (it just makes the game a good example of knowing when gameplay is more important than scaffolding, as is also the case with 7 Wonders). Settlers actually does have a bit of scaffolding built in. In the rulebook there is starting setup for beginners that gives an initial board layout and player positioning, thereby removing the issue of making a bad decision to start the game off. Yes indeed! As we mentioned in our post on teaching games (http://www.mostdangerousgamedesign.com/2013/07/designing-game-learning.html) Settlers does some clever things with the rulebook. Again, not saying Settlers is poorly designed, it's just a good example of the type of bad choice scaffolding through mechanics that we were talking about (which as you note is then alleviated through clever rulebook design). My first game of Catan was with a group of skilled players. I ended up with a bad initial placement and got schooled, bad. I was unable to get any traction, I was constantly behind, and, in short, it wasn't any fun. It was a long time before I had any interest whatsoever in playing again. That's not how I want newcomers to any of my games to feel. Speaking of Cities and Knights, I suppose the expansions are also a form of scaffolding. Would it be alright if I used your question as a topic for a midweek minipost tomorrow? Awesome post .Thanks for sharing this post with us. You should get as several giant luggage as ready to} to be able to store additional things. you'll be able to later sell these items and build golod.game recommendation As you recognize, gold is one amongst the foremost vital aspects of the sport and you can't neglect it. Believe Maine these luggage can are available handy.